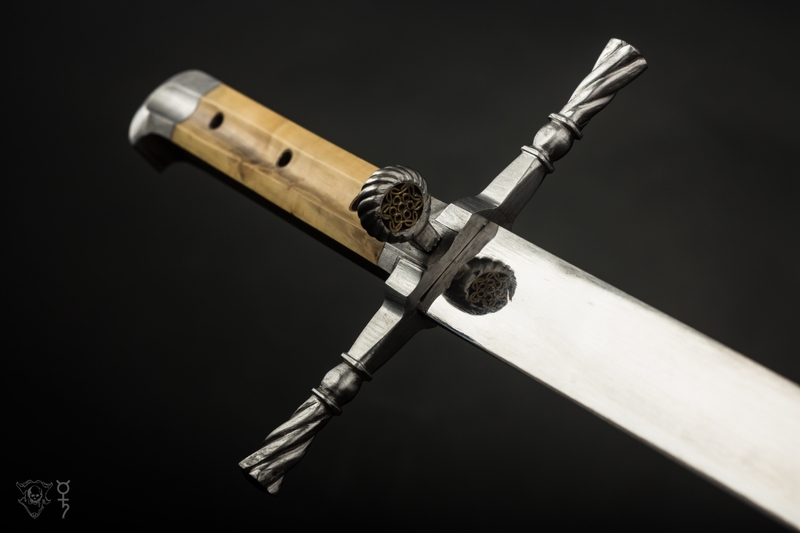 I'm Airton Péter Szabó from Landsknecht Emporium and this is my first blade that I consider worthy to be published here, hope you will like it. I made this piece for Daniel Jaquet as the prize for his Lifetime Achievement HEMA scholar award. It was my longest project so far and I lost count of the hours I spent with research, experimenting and finishing the messer. The set consist of a type m5b messer, two knives and an awl in a scabbard with additional sheaths mounted on it for the cutlery. Ádám Bodorics was kind enough to rough grind the blade and to forge out the byknives for me, so I could finish the grinding and start hilting them. My plan was to make a messer that would date around 1520-1540. Keeping that in mind I based the design of the quillons around 16th century messer from Rothenburg. After considering my options for the nagel I came to the conclusion that a N2C shaped one would suit aesthetically the best the hand filed writhen cross. This was the second nagel I made with such a mosaic and it became a passion of mine ever since then. The design for this one is taken from a surviving original made in the workshop of Hans Sumersperger. For the scabbard I wanted to keep it as historical as possible. It's lined with wool and made out of layers of 0.6mm thick larch veneers so it follows the cross sectional geometry of the blade, giving a perfect fit. When I finished the filing of the core I covered it with linen and attached the leather sheaths for the cutlery. For the cover I used vegetable tanned goatskin that I sewed on the backside. As for the decoration I chose an early 16th century southern German border design. Finally I ebonized the scabbard with iron acetate and added a crimson hand-woven cord to the back for suspension. It was my first time using exclusively bone glue for a project and it was a rather steep learning curve. It was hard to keep everything in place with a heat sensitive glue that has seconds of drying time. For later projects I'll switch to hide glue since it's more tacky and has better strength after drying. The byknives and the awl are made of Silver steel and shaped in distinctly 16th century fashion with integrated bolsters. Each of them has a CC1 formed pommel and hilted with the same boxwood as I used for the blade. I learned a lot through working on this messer. File work, mosaic pins, fitting, scabbard making. I consider such projects important part of a craftsman's life, I wanted to test my limits and by doing so I exceeded them. I'm still far away from the level of craftsmanship of the old masters, but I consider this blade as an important waypoint. I hope it will serve it's owner well. Well that is an introduction. Wow-- that is a very impressive Messer! Welcome to the forum! I hope we all get to see more of your work soon! This is glorious work! Love it.